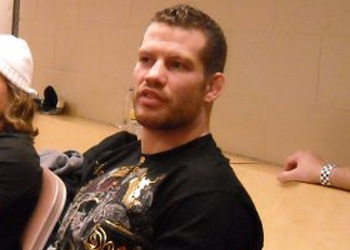 Hey, Nate Marquardt fans! What’s better than watching “Nate the Great” fight Rick Story on live television this Sunday? How about catching all of his best Octagon scraps on replay?! Alright, obviously the live broadcast of “UFC on Versus 4” is what most will be going with. However, in an interesting minor programming battle, Spike TV will offer up a Marquardt marathon running from 1PM ET/PT – 9PM ET/PT. Versus’ show starts live at 9PM ET/6PM PT. This means there will be an overabundance of Marquardt mania for a couple of hours. Thankfully for the advent of the DVR, Sunday shouldn’t present much of an issue for most of Marquardt’s fans. However, that’s not the important story here – as in, that’s not the big picture concerning the UFC’s small screen future. It’s been well publicized the UFC’s contract with Spike TV will expire at the end of this year. It also hasn’t been a secret Octagon brass have been shopping their product to countless other outlets and are reportedly in talks to purchase G4. Spike TV has been the home of free Octagon action since 2005. It’s been rumored they are going after Bellator just in case the UFC jumps ship.